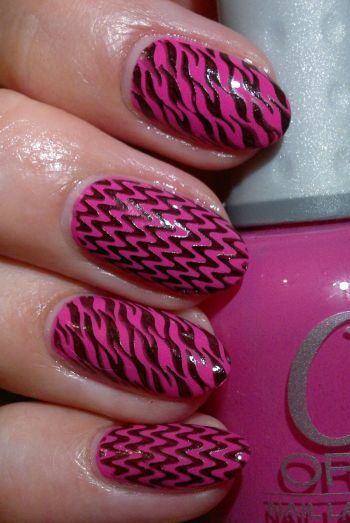 For this mani I painted my nails with Orly Basket Case (2 coats). I love this polish. The colour is gorgeous, and the formula is absolutely perfect. 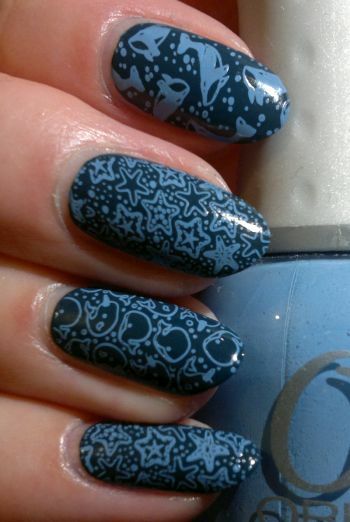 For the images I used 2 stamping plates – Pueen 116 (thumbs, index and middle fingers) and Pueen 117 (ring fingers, pinkies). These 2 stamping plates are part of Pueen‘s super cute Make Your Day stamping plate collection. I didn’t love this mani, but it was a nice enough filler mani for a few days. For this mani I painted my nails with Astor Fashion Studio 002 Cotton Candy (2 coats, thumbs, index and middle fingers). This is an OK nail polish. I decided to use it for this mani because the bottle is more than half-empty, and I’m thinking I might actually finish this polish! I used Pueen‘s 103 plate (which is part of Pueen‘s Make Your Day stamping plate collection) and Revlon Colorstay 270 Stiletto for the images. 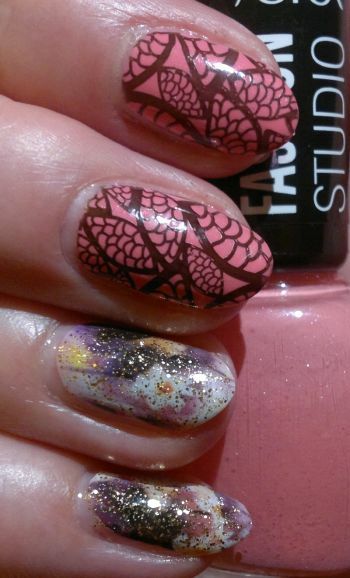 I used floral water decals for my ring fingers and pinkies, and I painted 1 coat of Orly Hair Band over them. Hi there! Today’s nail post is about my interpretation of a blue and silver winter mani. For this look I painted my nails with Revlon Colorstay 180 Indigo Night (2 coats). 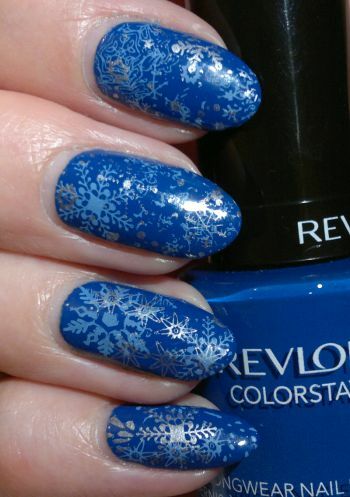 I used my unbranded Christmas-themed stamping plate and 2 regular polishes (Rimmel Lasting Finish Pro 280 Pure Silver and Orly Snow Cone) to stamp wintry images onto my nails. I really love this mani! Blue and silver look great together, and the double-stamped images look amazing! Hi there! Today’s post is about a mani I did this summer (but forgot to show you…). Oops! 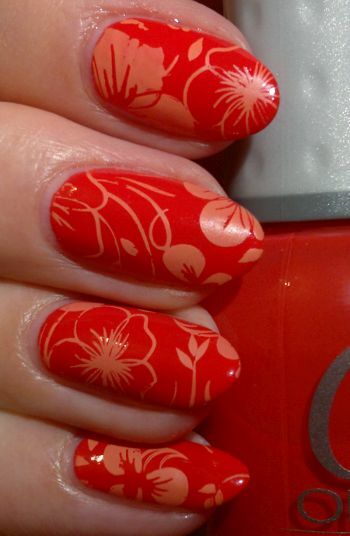 For this mani I painted my nails with Orly Terracotta (2 coats). I don’t know why they called this shade Terracotta. It’s a bright and beautiful watermelon-red. I wanted to stamp, and I chose one of my favourite stamping plates – Pueen‘s 72 plate which is part of Pueen‘s Stamping Buffet collection. The polish I stamped with is MoYou London‘s Cancun Coral. I didn’t love the mani because I’m really not a big fan of orange or red nails, but I think it looked nice and summery. Hi there! I’ve got another short Nail Of The Day post for you today. For this mani I painted my nails with Orly Basket Case (2 coats). I love this polish. The colour is gorgeous, the formula is a dream, and the polish dries reasonably quickly. Great stuff, Orly! 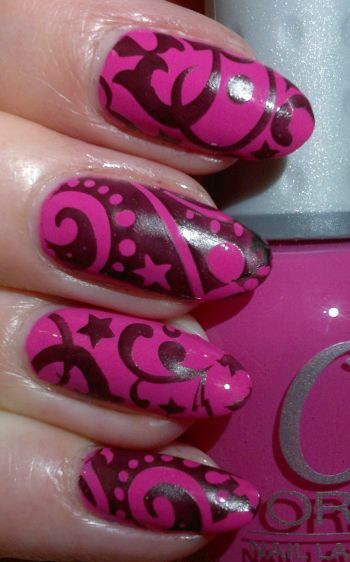 I used my new MoYou London Illusion 09 stamping plate and Revlon Colorstay 270 Stiletto for the images. I really like the look of this mani. This stamping plate wasn’t my first choice, but now I’m glad I bought it. 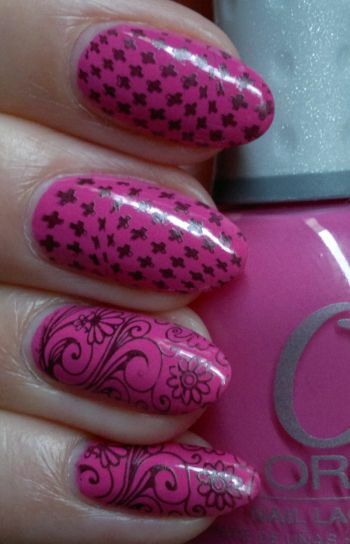 I can’t wait to use this stamping plate again! Oh, and by the way, if you’d like to order from MoYou, you can get 10% off if you order through this link.